A fabulous fashion show event is only weeks away in Sydney, Australia and it’s guaranteed to be a hit. The Fashion Mandu Show brings together diversity and creativity in their upcoming fashion extravaganza. This is a multicultural runway experience that is guaranteed to excite every attendee. This show is a contributor to the orphans of Nepal, as well as a contributor to the ever-changing fashion world which makes it all the more meaningful. The evening’s show will be choreographed by a guest model who was 1st runner up in a 2015 global competition. Fashion Mandu’s unique designs are based on the creative genius of eight designers. These designers are from all over the world and will bring their own distinctive heritage to the runway. Since these designers are representing their own personal culture; you will see some rare fashion pieces exclusive to the designer’s artistic values. Some highpoints of this one of a kind event includes performers from various cultures, a stall exhibition as well as food and drinks during the fashion show. For fun and relaxation, there will be an event of laughter yoga. Imagine the exceptional designs that will be worn by gorgeous models from around the globe… With such diversity and intercultural innovation, you’ll be able to see designs never before seen before this fashion extravaganza. Expect only the finest fabrics and matchless patterns in the Fashion Mandu show. If you have never attended a fashion gala event, then this event should be your first. The magnitude of originality and fashion design excellence at this event will definitely stay with you. Everyone will walk away from the show with a new respect for the diverse cultures and their innovative designers. Although the fashion runway is the main event; each of the remaining highlights will be riveting to partake in and will further enhance the Fashion Mandu experience. Three levels of tickets are available for purchase. Each ticket includes a meal and drinks. 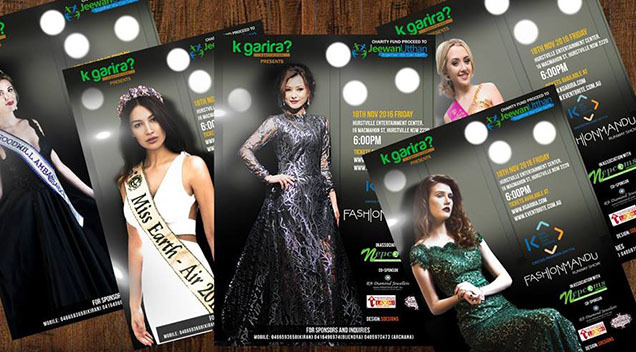 If one wishes to be seated front and centre for a close view of the incredible models wearing astounding, creative designs; then the tickets are available for a somewhat higher cost. Of course, the tickets are worth every dollar spent if you really want to experience this mind-blowing fashion event. One of a kind fashion shows with such a diverse cultural atmosphere are rare so don’t miss out on the Fashion Mandu Show on November 18, 2016 at the Marana Theatre. Are You Ready For Fashion Mandu 2016? ?